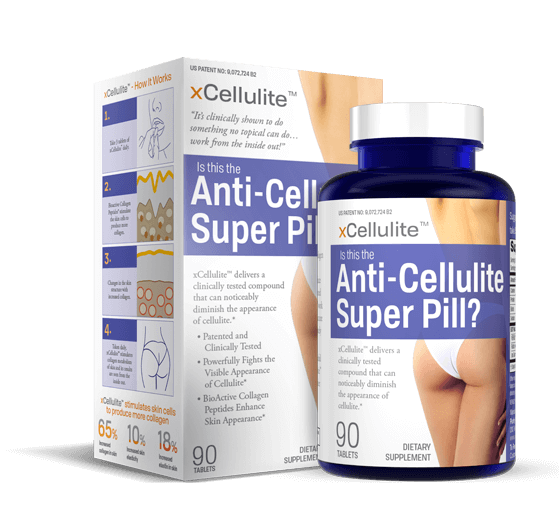 The Anti-Cellulite "Miracle"... is a Pill? What if you could improve your skin from within? Imagine our surprise when the natural power of collagen not only smoothed fine lines and wrinkles, but visibly reduced the appearance of cellulite. Science verifies, xCellulite™ is the collagen-packed beauty power-pill your skin has been waiting for. Cellulite Has Finally Met its Match! Could it be that until now we’ve been thinking about how to battle cellulite all wrong? Over the years, women have tried everything to combat unsightly "cottage cheese" on their thighs, buttocks, and abdomen which can lead to psychological distress and embarrassment. When exercise, diet, creams, massage, and contraptions all failed, the only thing left to do was hide behind clothing. 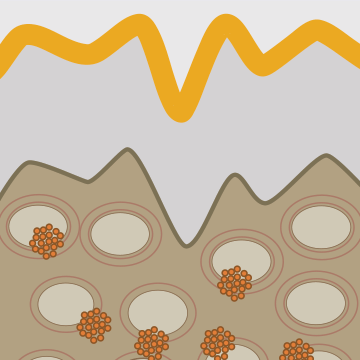 Cellulite, is caused by disturbances on the dermal matrix and an excess of fluids and fat under the skin, is traditionally battled from the outside. We knew it was time to try something different. Until now there have been no alternatives to creams and topical lotions for women who are fed up with cellulite. We needed to take a revolutionary approach to solve a difficult issue that plagues so many women. It starts with understanding what causes cellulite and fighting it at the root of the problem—inside the body. This product is truly unique. The Bioactive Collagen Peptides in xCellulite™ fortify collagen at the deepest levels. * It's a new front in the war on cellulite. Something no creams or other topicals can do. 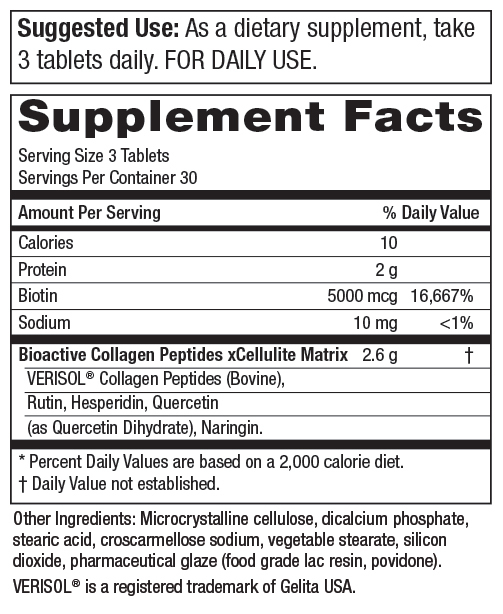 Take 3 tablets of xCellulite™ daily. 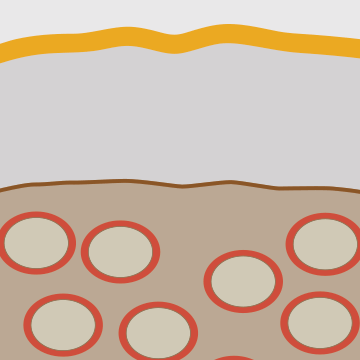 Changes in the skin structure occur due to the increased collagen. If you're one of the 85% of women worldwide affected by cellulite, get excited! 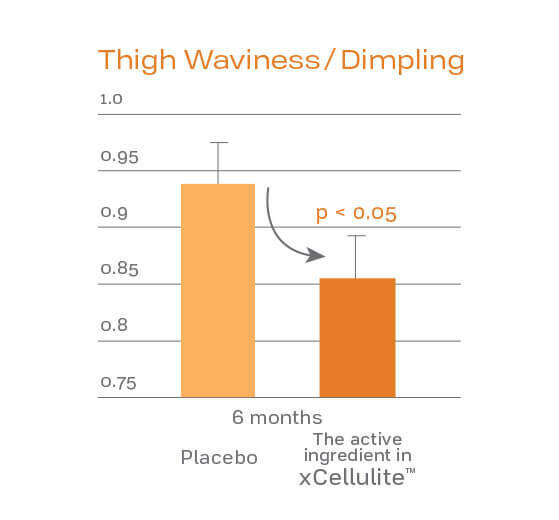 xCellulite™ delivers a clinically tested compound that was shown to noticeably diminish the appearance of cellulite in normal healthy women. * In a study of over 100 women between the ages of 24 and 55 years, the results were significant. These findings demonstrate the cellulite-fighting power of more collagen in skin. Plus, as if that isn't enough, the Bioactive Collagen Peptides in xCellulite™ also provide other beauty benefits such as reducing fine lines and wrinkles and promoting healthy hair and nails. 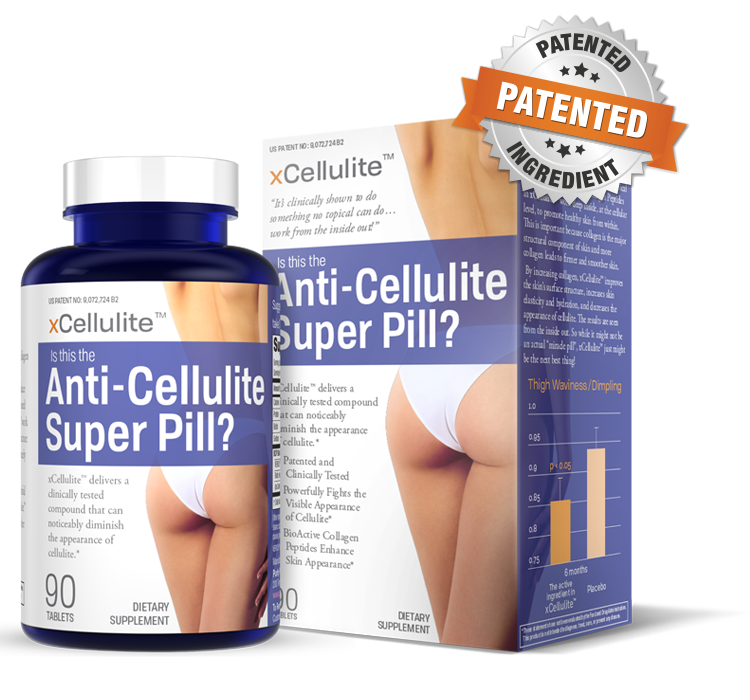 * These are results you will be ecstatic to see in the mirror — and now is the perfect time to get started using xCellulite™ with this FREE† bottle offer! † - $4.95 shipping and handling fee applies. By accepting our exclusive Free bottle offer for xCellulite™ (30 day supply) you will be enrolled as a Super Saver. As a Super Saver, you will receive 3 bottles every 90 days at the discounted price of just $29.95 per bottle (25% off retail), plus $4.95 shipping and if applicable your state and local tax, charged to the payment method provided today. Each bottle is a 1-month supply. Your first delivery of 3 bottles will ship about 3 weeks after you receive your Trial bottle, so you don't miss a day. If you wish to change the frequency, date of shipment or number of bottles on Super Saver, you can sign up for online access or call Customer Care at 1-888-769-7873.